I do love me some Marvel's Agents of S.H.I.E.L.D. I seriously cannot get enough of it, which is a good thing since I talk about it basically every week. So picking up a copy of Agents of S.H.I.E.L.D. : Season One Declassified was a must! Agents of S.H.I.E.L.D. 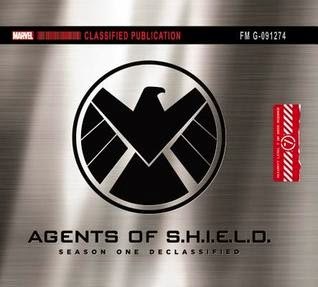 : Season One Declassified by Troy Benjamin reads like a S.H.I.E.L.D. report that you must be properly clearanced to access. Luckily Level Seven agents are cleared to review this report. The book opens with an introduction that includes a history of S.H.I.E.L.D. and the rise of Agent Phil Coulson. The text then jumps into the preproduction phase of the show and focuses on the casting of our key agents found on the Bus. Then we get into the heart of the book. Benjamin provides an episode by episode breakdown that provides key facts about each episode, a mission briefing, specifics about each show which could include guest stars or shooting challenges, and crew mini-profiles which outline not just the person but what the job title does to support the show. These episode breakdowns run around five pages a piece. After discussing each episode Benjamin focuses in on key crew with coverage of the work of costume designer Ann Foley, Property Master Scott Bauer, and Composer Bear McCreary with detailed examination of work they completed for the show. I mentally file Agents of S.H.I.E.L.D. : Season One Declassified into the art book category. So generally this means my expectation is low word count with maximum visuals. The book does completely win over the reader with images which include production photos and concept art, like one expects. And the book design as a S.H.I.E.L.D. file by Nelson Riberio puts the reader into the proper spy frame of mind. There is no denying the book looks great in its slipcover sitting on the book shelve. But the real win for me was the large amount of text found in the book. Benjamin provides his readers massive amounts of intelligence on the show. I have found some art books in the past rely on massive amounts of dead space to help frame the prized images. Here text pages are rarely sparse but instead densely packed with information for the fact loving fanboy (like me). The actress who plays Raina was almost cast as someone else on the team. Why was Bill Paxton cast? Do Clark Gregg's suits speak about the character and his journey? And the ultimate magic, how does Lola fly? The book is full of this sort of information. As I read the book I found myself texting facts and questions to friends who love the show just as much as me. I now know exactly how many Chitauri helmets were made for The Avengers. Believe me, when you find out the answer it will help you have a better understanding of movie making. I know what episode the Zorro Parking Structure was used in as a shooting location, and allowed myself to geek out as I realized I have parked there! And most of all, I know how the production staff prepared for the events of Captain America: The Winter Soldier and how the cast reacted when they got the news that their story had significantly changed! I fully admit it, I am the audience of this book. Though the price tag is pretty high. So I can understand if you have to pass. But if you are going to spend your money on a Disney/Marvel art book, Agents of S.H.I.E.L.D. : Season One Declassified is the type of book to consider with its balance of great art and facts about production. It made me a hot mess and I thoroughly enjoyed reading through it, and plan to return to it again as a reference in my fandom. For weekly coverage of Marvel's Agents of S.H.I.E.L.D. 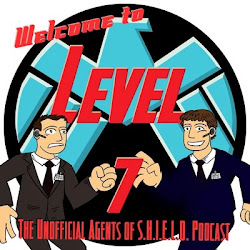 follow my podcast Welcome to Level Seven.